Photo by Ann Lindemanandamp;#8220;Billandamp;#8221; Dewhurst, today. TAHOE CITY, Calif. andamp;#8212; In a region plagued with a fickle seasonal economy and arduous winters that tax even the most diehard outdoor enthusiasts, the expression andamp;#8220;longtime Tahoe localandamp;#8221; is indeed a badge of honor. While opinions may differ on just how many years are required for this esteemed moniker, no one would argue that Mary Louise andamp;#8220;Billandamp;#8221; Soll Dewhurst has earned bragging rights to the title after spending more than eight decades living on the shores of Lake Tahoe.Adding to her list of local qualifications, Dewhurst, 85, can also boast that her childhood home is now a California State Park, as her parents were the year-round caretakers of the Hellman Ehrman Mansion (aka Pine Lodge) located in Sugar Pine Point State Park on the West Shore. andamp;#8220;It was all I ever knew, so I never thought it was anything special or unique,andamp;#8221; Dewhurst says in the sunny kitchen of her modest Incline Village lakeside home. She leafs through a vintage photo album filled with images that depict both the ordinary (a rumpled post-nap toddler showing off her new shoes) and the extraordinary (Mary, the family’s beloved pet deer, wearing a collar and bell, gently nibbling a treat from a child’s hand).In 1916 Dewhurst’s parents, Henry and Annie Soll, and daughter, Agnes, 5, moved from Washington State to Lake Tahoe. With many months spent alone at the estate, the position suited Henry, a sturdy native of Demark, and Annie, whose own father was a forest ranger who was gone on patrols for weeks at a time. andamp;#8220;I don’t think my mother ever had any regrets about the life we led, but I do think she thought they would be living off the land more than they did, gardening wasn’t that good in Tahoe … that and she missed the rain,andamp;#8221; Dewhurst recalls. In 1922 Alice (nicknamed Tator) was born, followed by the birth of Mary Louise andamp;#8220;Billandamp;#8221; Soll on Jan. 21, 1924. With no nearby hospitals, Annie Soll traveled by train to Sacramento to give birth to her third child. Two weeks later, mother and daughter returned to Tahoe City where they were met by Henry in a motorboat as the road was closed for the winter. According to Dewhurst, she got her masculine name because her father was mistakenly told that the new baby was a longed for boy. andamp;#8220;Later, as an adult, I needed a Coast Guard pass to sail in San Francisco Bay during the War,andamp;#8221; Dewhurst remembers. andamp;#8220;That entailed gettingmy birth certificate, and that listed me as Mary Louise. When I asked my mom about it, she said, andamp;#8216;Oh so that’s what they put down.’ I guess names weren’t very important to her, since I was already Bill.During this era very few people wintered at the lake and the ones who did formed a close-knit community. The adults visited each other in the evening for a game of bridge and Thanksgivings were spent with the Pomins who were caretakers at the Fleishaker estate near Eagle Rock. Water came from a pump in the kitchen and lighting was provided by oil lamps and candles. Due to winter road closures, children went to school in the spring and summer months.In a time when snow came regularly and in enormous amounts, Henry Soll did his fair share of shoveling at the estate. Perhaps shoveling was a family point of pride as Dewhurst shunned power snow blowers until very recently.Incline resident Skip Schamback, a close friend of Dewhurst’s, recalls their first meeting two years ago.andamp;#8220;I remember asking her andamp;#8216;who does your snow removal?’andamp;#8221; Schamback, 57, says. andamp;#8220;She looked kind of puzzled and held up a basic snow shovel, indicating that she did it. I couldn’t believe it.andamp;#8221;Nevertheless springtime is always welcomed and Dewhurst remembers how eagerly she’d anticipate the Ehrmans’ return.andamp;#8220;They’d arrive in June and stay until the day after Labor Day,andamp;#8221; she says. andamp;#8220;They’d come by train and then by boat to the pier. All the help would be lined up on the pier and my sister and I would have on the outfits that Mrs. Erhman had sent. She’d tell my dad: andamp;#8216;It looks perfectly lovely.’andamp;#8221;According to Dewhurst, Florence Hellman Ehrman took the Soll family under her wing with yearly shipments of casual and fancy outfits for the children from the tony San Francisco department store, I. Magnin and eventually funding the girls’ college educations.Thanks to Mrs. Ehrman, Dewhurst went to the University of California, Berkeley in 1941. 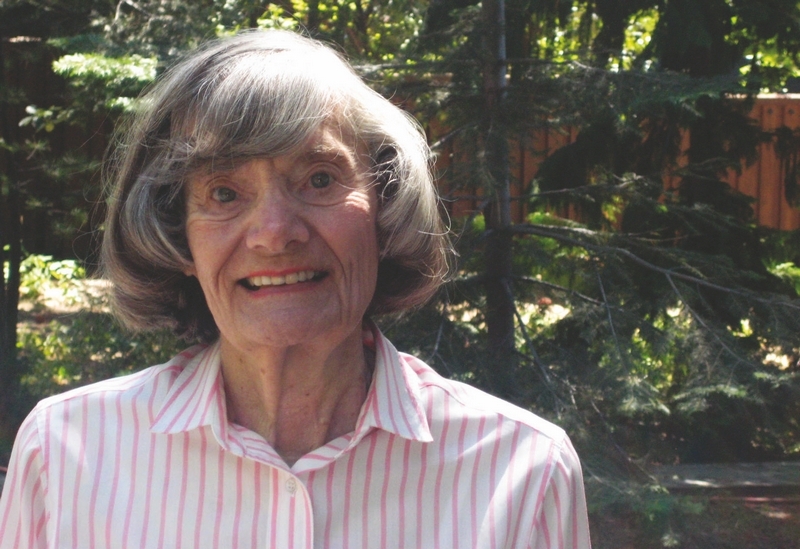 She remembers feeling overwhelmed and confused by city life after a lifetime in remote Tahoe. In 1942 World War II interrupted Dewhurst’s schooling and she married Dewey, the love of her life. andamp;#8220;I remember bringing him home to meet my parents and we took him for a boat ride on the lake,andamp;#8221; she says, her eyes sparkling at the sweet memory. andamp;#8220;He’d never been to Tahoe and he asked: andamp;#8216;I want to live here, what can I do for work?’andamp;#8221;Then, like now, good jobs were limited. After the war Dewey, a mechanical engineer, received his teaching credentials and taught school for 30 years in Tahoe City. The couple first lived in Ward Canyon, and later in the 1950s they purchased a lot from George Whittell in Incline Village where they built a house. To this day, Dewey is remembered for his gifted teaching style.From her charming home, Dewhurst gazes across a lake that is bedazzled with sparkles of late-morning sunlight. While some seniors flee to warmer climes, Dewhurst plans to bloom where she was planted so many years ago.andamp;#8220;If anything her appreciation for this beautiful place has grown with time,andamp;#8221; explains Kurt Heisinger, 46, who spent his childhood summering with his grandparents, who were neighbors of the Dewhursts. andamp;#8220;Just the other day she told me she wakes up in the morning, looks at the lake, and tells herself how lucky she is to live here.’andamp;#8221;andamp;#8212; After living for just 20 years at Lake Tahoe, writer Ann Lindemann realizes she is no where near longtime Tahoe local status. As she travels around the lake daily, Lindemann is appreciative of the marvelous historical lens that Mrs. Dewhurst so kindly offered.